In order to maintain genome integrity, cells have evolved a complex network of processes that detect, repair and signal DNA damage. 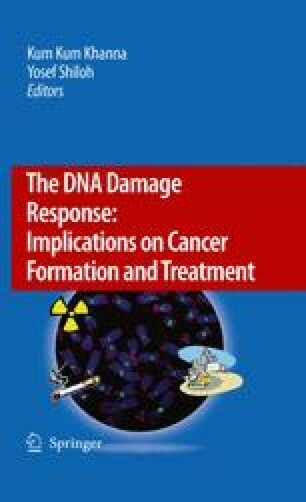 In this chapter, I review the early steps of DNA damage signaling with a particular emphasis on how DNA lesions are sensed and how the detection of DNA damage leads to the activation of DNA damage signaling by the ATM and ATR protein kinases. I am indebted to Rachel Szilard who has patiently proofread this manuscript. The ideas on the bypass of the loss of ATM by activating DNA-PK were formed during discussions with Steve Jackson and Andre Nussenzweig. Finally, work on DNA damage signaling in my laboratory is supported by grants from the Canadian Institutes of Health Research (MOP89754 and MOP84297).